Route 6A, which cuts through this 429-acre property, neatly divides it into two sections, each with its own character. The portion to the north of Route 6A, dubbed the "Mansion," takes its name from the Nickerson Family Mansion and Carriage House, a sprawling structure that dates to 1912—he was a sea captain—and is listed on the National Register of Historic Places. To the west, the resort encompasses a collection of neighborhoods dubbed "Villages." Distributed across the property are 11 hard and clay tennis courts, an 18-hole Jack Nicklaus golf course, a private beach, five swimming pools—two of them indoors—two fitness centers, and a spa treatment room. 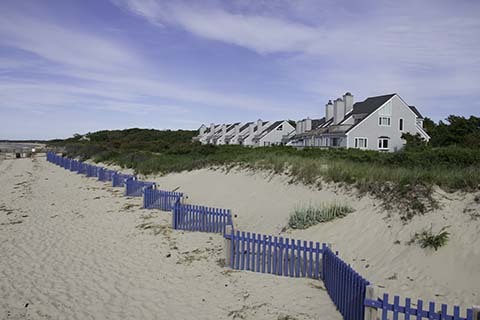 What's more, the 40-mile Cape Cod Rail Trail, a dedicated bike and jogging path, cuts through the resort on its way to the Cap Cod National Seashore. There are two staffed tennis complexes: Bay Pines on the Mansion side, which has five Har-Tru courts, and Fletcher Village, which has four hard courts (there are another two hard courts at Britterige Village). Activity abounds at both locations in summer. The weekly rosters include a variety of clinics, advanced workouts focusing on the modern game and critiques of match play, workouts with the pros, boot camps, social round robins, happy hours, and game matching. A series of junior clinics is offered at both complexes as well. Tennis Staff. Jim Leahy, who came to Ocean Edge in 2001, has the simple goal of wanting every guest to play tennis. "I want those courts always happening," he told me. To that end he schedules some kind of adult or junior clinic or round robin for nearly every hour of the day, "I want people to see tennis as fun," he continued. "My goal is to get every guest involved." He himself started playing tennis at age 12, competed for Indiana University, and then was derailed from his plans to attend law school when the job as head pro at a club in Kingston, MA, fell in his lap and he never looked back. Tennis Programs. There are junior programs for three different levels—4-7, 8-11, and 11-15— nearly every afternoon. Adults can choose from clinics at various levels, workouts with the pro, Express clinics (20 minutes of instruction, 20 minutes of cardio, 20 minutes of play), advanced workshops, and daily round robins, the last distinguished by a solid turnout of 12 to 16 players. Courts & Fees. Details to come. Court fees: $24/hour on clay, $20/hour on hard. Beach. Guests staying on the Mansion side have access to 700 feet of private beach; for others there are the private beaches of Brewster and, of course, Cap Cod National Seashore. Golf Courses. The resort has Cape Cod's only Jack Nicklaus-designed golf, a challenging 18-hole layout open only to resort guests and members. Fitness Center. The main fitness center is at the Mansion, adjacent to its indoor pool (there's a cardio room on the villages side). It has LifeFitness cardio equipment as well as multi-station strength training equipment and free weights. The resort also stages fitness classes, including Pilates, there and in the adjacent indoor pool. And ... There are three outdoor pools and two indoor pools scatted across the property. Bikes are available for rent to better take advantage of the Cape Cod bike trail. During the summer, the Ocean EdgeVenture provides supervised activities and games for kids ages 4 to 9 six days a week. There's also a jam-packed weekly calendar of activities for the whole family, including sand volleyball, bingo, movie nights at the Arbor pool, scavenger hunts, and more. The Mansion side has 90 hotel rooms, each with a bay or garden view and furnished in updated Cape Cod style, and a group of 2- and 3-bedroom kitchen-equipped villas nestled in the trees near the bay. On the Villages side you can choose from 1-, 2-, or 3-bedroom villas, also with full kitchens. Ocean Edge has half-a-dozen places to eat or drink, ranging from the Ocean Terrace at the Mansion with its sweeping views of the bay to Snack Cabanas in various locations, including the golf course and poolside. Seasons. Year-round; however, tennis reaches a peak in summer. Travel Instructions. The nearest major gateways Boston's Logan International Airport(BOS) or T.F. Green Airport(PVD) in Providence, RI. General Tourist Information. For information about vacationing on Cape Cod, visit Cape Cod Chamber of Commerce website or phone toll-free, 888-33CapeCod. Or for information about Massachusetts as a whole, visit the Massachusetts Office of Travel & Tourism website or phone toll-free, 800- 227-MASS (US and Canada). So far, I haven't received any written feedback on Ocean Edge Resort & Golf Club. If you've taken a tennis vacation there, I'd like to hear your reactions.